ISLAMABAD: A Pakistan International Airlines plane crashed Wednesday on a domestic flight from Chitral to Islamabad, killing all 47 people on board, aviation authorities said. 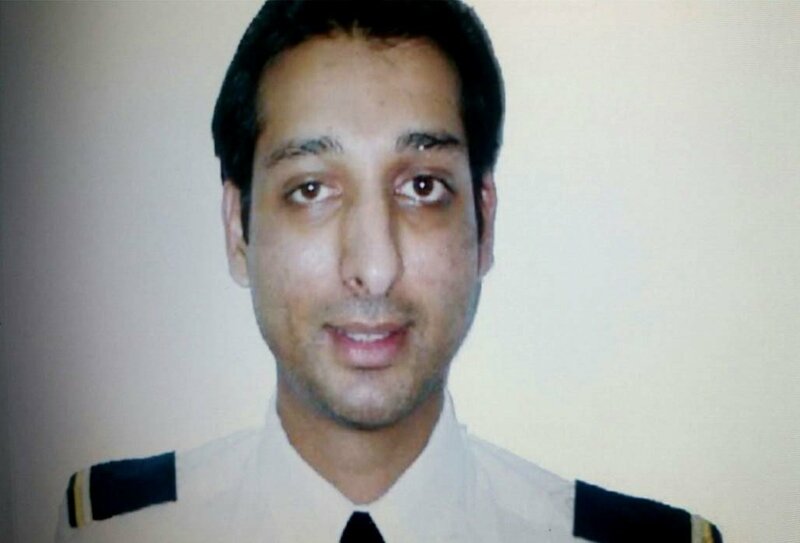 "I think that there was no technical error or human error ...obviously there will be a proper investigation," he said. Military said 36 bodies were retrieved from the debris of the plane and being Shifted to Ayub Medical Teaching Hospital, where a special cell has been set up. An aviation official said it was too early to say anything about the cause of the crash, but it probably occurred due to engine failure. 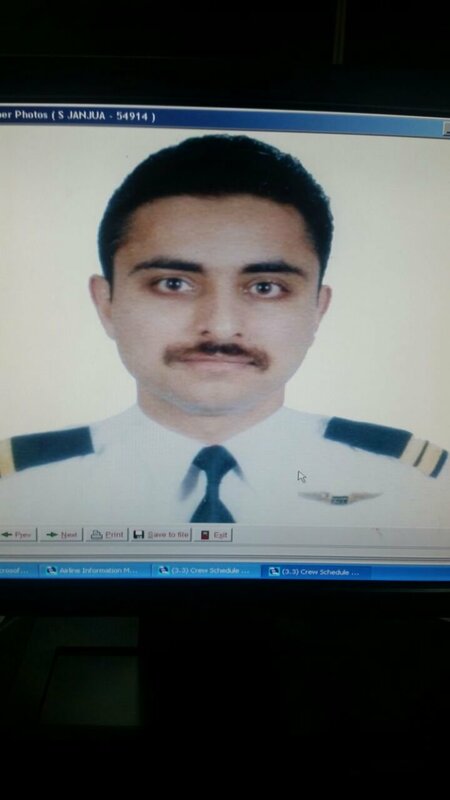 The Islamabad bound flight PK-661 took off at 3:30 pm from Chitral and went missing near Abbottabad before the pilots lost control over the aircraft and contact with control tower around 4:22 pm . A thick cloud of smoke was also seen billowing from the area where the aircraft came down. 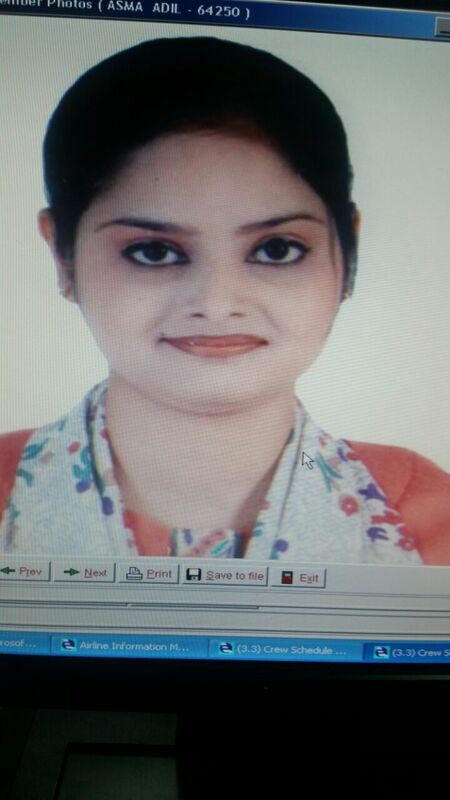 Former famous Pakistani singer Junaid Jamshed, his wife Nahya, and Deputy Commissioner Osama Ahmed Waraich were also among the passengers on the ill fated plane. According to family members, Jamshed was in Chitral on a preaching tour. 31 men, nine women and two infants were on board the flight, including at least three foreigners, according to local media reports. Civil and military rescue teams were dispatched to the scene of the crash. 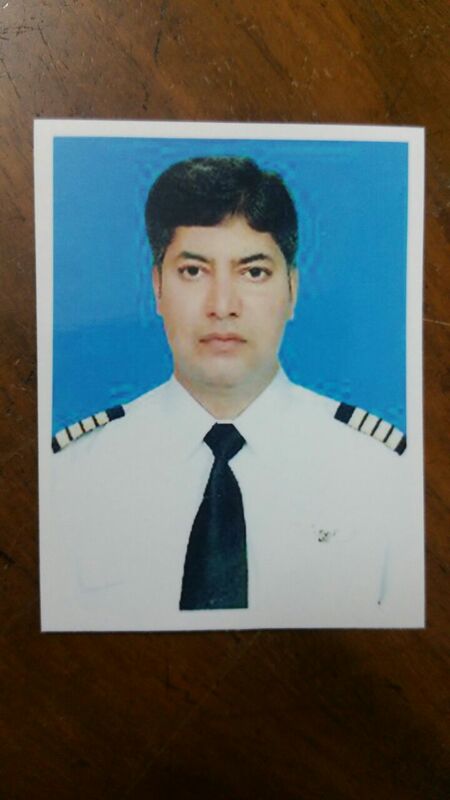 Five members of the crew were identified as pilot Saleh Janjua, co-pilot Ahmed Janjua, trainee pilot Aly Akram, and air hostesses Sadaf Farooq and Asma Adil. Prime Minister Nawaz Sharif and President Mamnoon Hussain PTI chairman Imran Khan expressed sorrow over the loss of precious lives in tragic PIA plane crash. 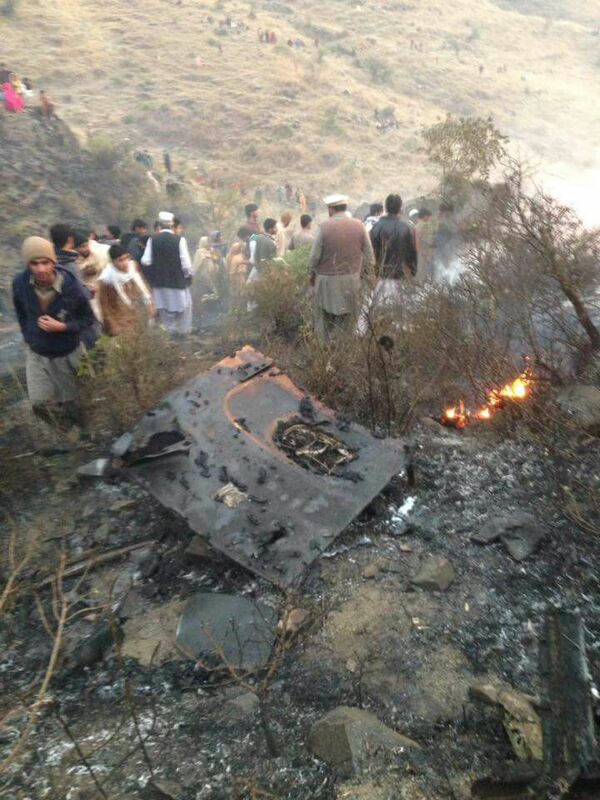 Shocked & saddened by the tragic PIA plane crash near HavelIan. May Allah give the families of the deceased courage to bear their loss. 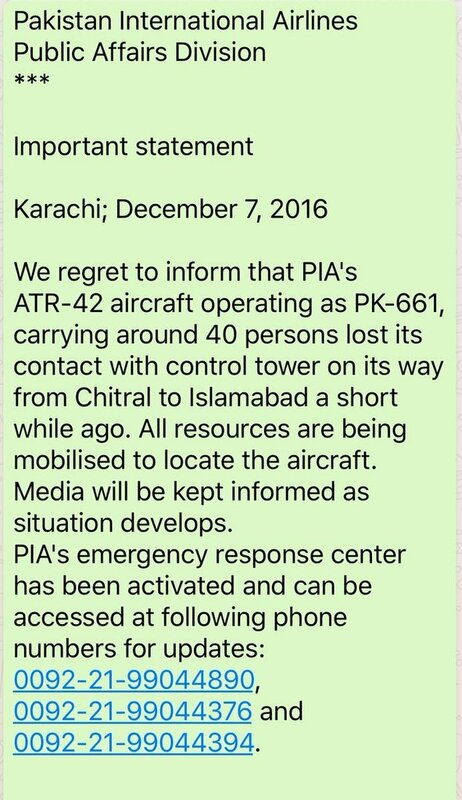 "We regret to inform that PIA’s ATR-42 aircraft operating as PK-661, carrying around 40 passengers lost its contact with control tower on its way from Chitral to Islamabad a short while ago," PIA spokesman Danyal Gilani said. Prime Minister Nawaz Sharif and Interior Minister Chaudhry Nisar Ali Khan have directed the concerned federal departments to immediately initiate rescue efforts and help provincial government, said a statement. 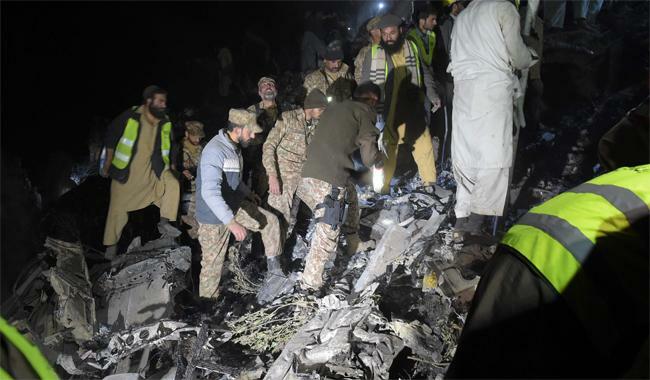 Pakistan´s last major air disaster was in 2015 when a Pakistani military helicopter crashed in a remote northern valley, killing eight people including the Norwegian, Philippine and Indonesian envoys and the wives of Malaysian and Indonesian envoys. The deadliest crash was in 2010, when an Airbus 321 operated by private airline Airblue and flying from Karachi crashed into hills outside Islamabad while about to land, killing all 152 on board.